I really am starting to love Throwback Thursday. This is a weekly post where I dig into the dusty old archives (OK, just from last year) and share an older post that you may have originally missed on Running for Dummies, back from when my mother was my only #1 reader (she still is). I love it because it is fun to dig through old pictures and brag about share how cute I was when I was five. Yeah, I know I promised to share more of the pictures from those awkward years, trust me those pictures are plenty, but it is much more fun (for me) to show you how cute I used to be as a toddler. I definitely hit my cute-peak at age five, and it is has all been down hill from there. 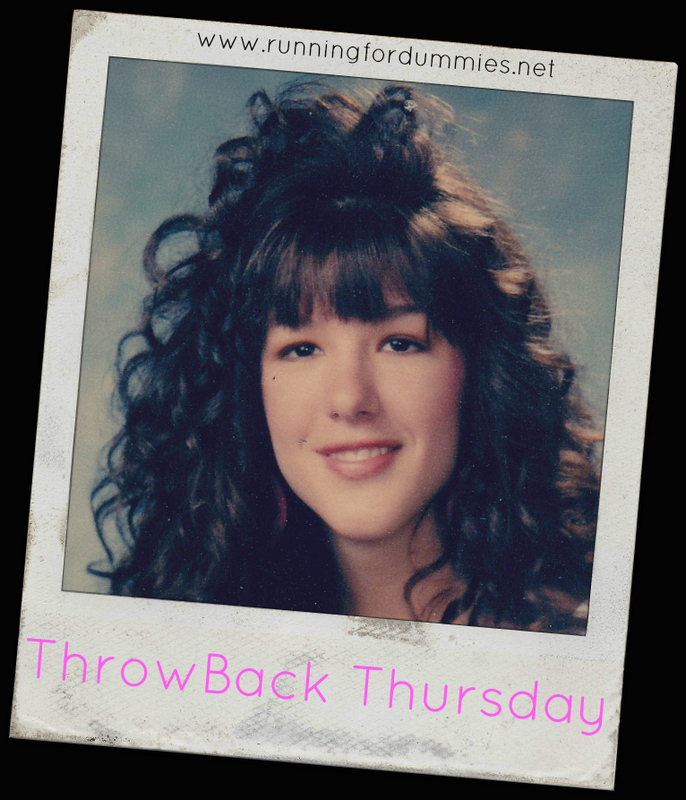 Let's compromise this week, you can laugh at with me while I share a picture from high school when my hair was much too big and stiff for my own good. Who didn't love Aqua Net back then? I'd love to tell you this is from the 80's which would excuse the embarrassing hair, but it was actually my high school senior year portrait taken in 1992. There is a full-grown-legal-to-drink-aged person between me in this picture and me now. But the real reason I love Throwback Thursday is because I always end up re-motivating myself with these old posts. Sometimes I read things that I wrote 8-9 months ago and it triggers something. "Oh yeah, I am sooo smart," (and modest, apparently). Sometimes we all need those gentle reminders of all the things we already know. This post, "I Hate Weight Training and Other Lies I Told Myself" reminded me not to listen to that negative self-talk, to not place self-imposed limitations or labels on myself, and to remain open minded. I hope you'll click over there and check out how I learned that despite what I always thought, even though I self-identify as a runner, I actually love weight training. Who knew? Don't let who you think you are keep you from being all that you can be. Love that giant hair! And I get your feelings on weight training, I've always been too timid to go anywhere near the weights at the gym. My boyfriend has been training me in exercises to do with them, and I'm now confident enough to load up a bar by myself, and I get such a feeling of pride everytime I manage an extra 5 pounds. I still love running, but this is great too! I feel that way about yoga - that I know it is supposed to be good for me but I don't like it and I'm not very good at it. My friends are trying to convince me otherwise! I know I was one of those too..